So, what’s behind Servitization and new business models? As traditional products are commoditized, producers of industrial machinery are shifting from selling physical products to providing complete solutions. Generating more than 50% of revenue from services is a common goal for companies who are looking for higher profit margins and increased customer intimacy. Also, industrial machinery manufacturers are considering new business models, mainly based on services. One example is Tennant (http://www.tennantco.com), a producer of equipment used to clean and maintain indoor and outdoor surfaces. Tennant is augmenting its solution portfolio with Information-as-a-Service (IaaS), selling valuable information to their customers. They collect asset-related usage and condition data through the Internet of Things (IoT), convert this – and other asset-related data – into valuable information and make this information available to their customers via a portal. The information Tennant collects and converts helps customers optimize the utilization of their cleaning machines. The new service is the customer Portal called the IRIS Asset Manager, where Tennant employees, customers, and partners can access asset-related information and analytics. One way for producers of industrial machinery to grow their business is to increase their share of their customers’ equipment lifecycle costs by taking more responsibility for the Operational Equipment Effectiveness (OEE) of their customers’ assets. On the vertical axis, you see this level of responsibility. On the horizontal axis is the OEM’s share of the overall equipment lifecycle costs. On the small graphic on the lower right you see how these costs typically are subdivided: only about 20% is the purchasing costs of the assets, the rest is operating costs! The main portions are costs for energy and maintenance. The orange line is the manufacturer’s revenue. Product sales represents only about 20% of the overall revenue potential. 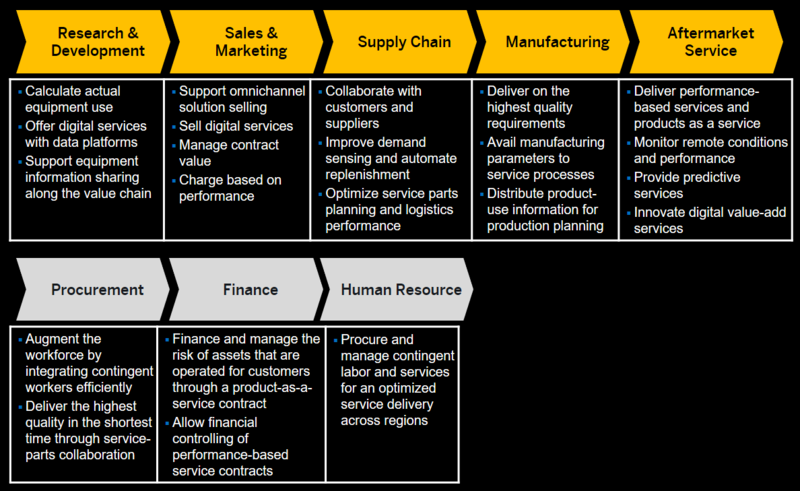 By offering and providing services manufacturers increase their revenues. Traditional services include support services, break-fix repair services, maintenance services, and spare parts sales. More and more manufacturers today also deliver value-add services like training, consulting, and optimization services. Often these services are intended to help customers save energy, which can be the biggest portion of the customer’s equipment lifecycle costs. Also, data-as-a-service and information-as-a-service – like in the Tennant example – fall under this category. With outcome services, industrial manufacturers help their customers to achieve defined business results or guarantee a defined equipment performance. With financial services, they are stepping into the shoes of the bankers, helping customers to finance products. The highest level of servitization is Equipment-as-a-Service (EaaS) or pay-per-use. Here the manufacturer provides the equipment, the customer just pays for the usage or output. These additional revenue streams are only valuable when they come with profitability, so we also need to look at the costs of service. With efficient service processes and technologies these costs should grow in a curve (the purple one on the illustration) that is flatter than the revenue curve. Service efficiency is a driver for profitability. Support and repair services typically provide a low profitability, but with advanced services, you can increase your service profitability. To run the strategic initiative ‘Servitization and new business models’ successfully, it needs to be supported throughout the entire value chain of an industrial manufacturing company. This illustration shows only some of the aspects that you need to consider. With the right digital business framework, producers of industrial machinery can put more focus on services and new business models. And with that they can grow their business and improve their profitability. I look forward to your comments on this topic. How is servitization driving new business models in your organization? Ulf Guttmann focuses on solution management and go-to-market for SAP’s Industrial Machinery and Components Business Unit. With over 26 years of SAP experience, he is well versed in the aftermarket service, enterprise asset management, sales, and marketing solution areas.